One of those events where you come away inspired. 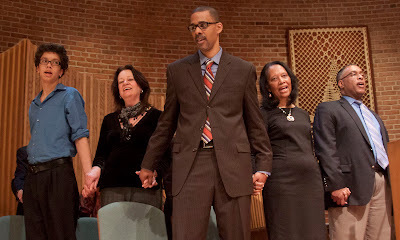 Inspired by how far we as a people have come, inspired by how far we still have to go, inspired by beautiful music….inspired by the event ending with everyone holding hands and singing we shall overcome someday! At the beautiful Central Unitarian Church in Paramus with most of the county luminaries, a great keynote speech…first Theordora Smiley Lacey, former Teaneck teacher and civil rights activist spoke about growing up in Montgomery Alabama, knowing and working with Dr. King, and then being involved in the struggle in Bergen County to integrate the Teaneck schools. 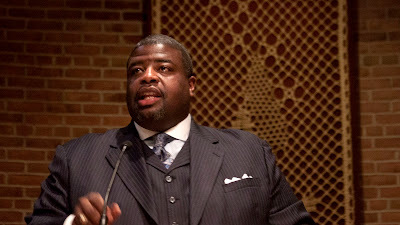 Then her son, Clinton Lacey, deputy Commissioner of the NYC Department of Correction brought home how the struggle is far from over. Others spoke up includinga chance for the local politicians to speak. 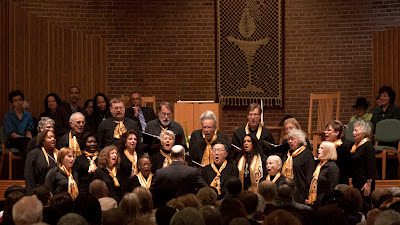 Some great musical numbers, my friend Al Stawsky presented the Lee Reid award (which had been awarded to Al’s late wife, May)….and finally, well, hundreds of voices, a spontaneous joining of hands and “We shall overcome”….hope my pictures help at least a little. Teaneck Community Choir singing.Photos by TOM HART. Aryana Alborzi of Leonia Highschool as Mr. Johnson explained that it wasn't her fault it didn't work. She commented 'I'm so embarressed.' to those immediately around her including the photographer. 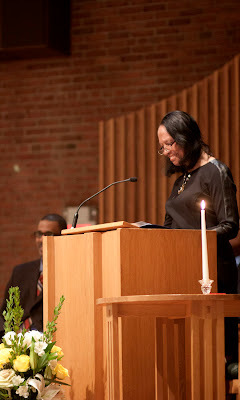 Theodora Smiley Lacey giving the keynote address as her son Clinton looks on. 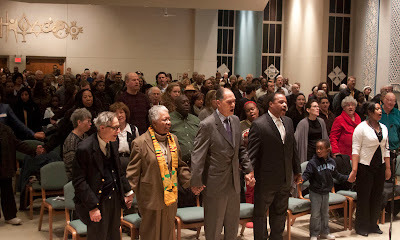 PARAMUS NJ 1/16/2012 MARTIN LUTHER KING BIRTHDAY CELEBRATION AT CENTRAL UNITERIAN CHURCH. Photos by TOM HART. 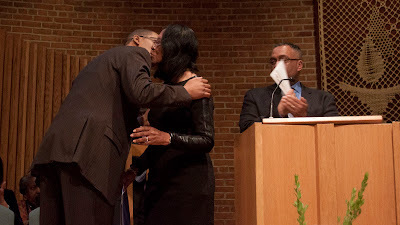 Theodora Smiley Lacey after giving the keynote address getting hugged by her son Clinton. Photos by TOM HART. Dr. Ardie Walser President of Teaneck Board of Ed speaking out as another voice against oppresion. Photos by TOM HART . Assemblywoman Valerie Huttle speaking out as another voice against oppresion. with Mr. Lacey in the background. Photos by TOM HART. 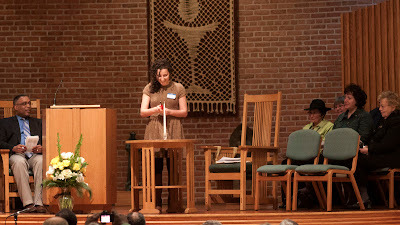 Al Stawsky of Teaneck and the Uniterian Universalist congregation of the Palisades of Englewood presenting the Rev. 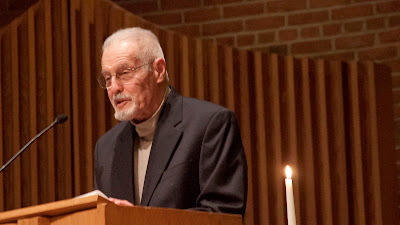 Lee Reid award, named for the founder of the congregation. Photos by TOM HART. Rev. Vernon Walton of the Mt. 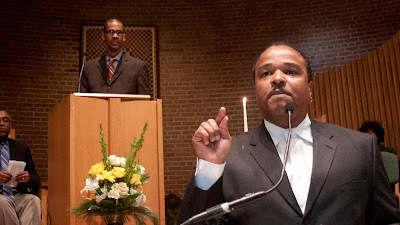 Calvary Baptist Church accepting A the Rev. 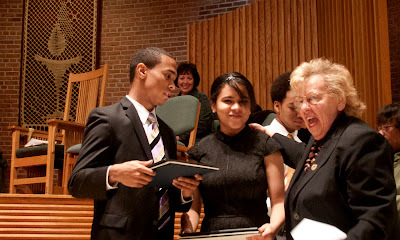 Lee Reid award, named for the founder of the the Uniterian Universalist congregation of the Palisades of Englewood. Photos by TOM HART. 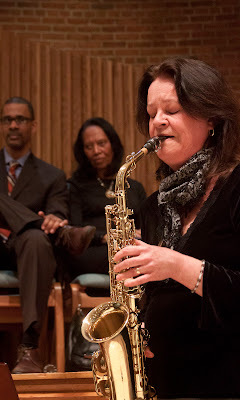 Debbie Johns of Englewood playing sax. Photos by TOM HART/ FREELANCE PHOTOGRAPHER. 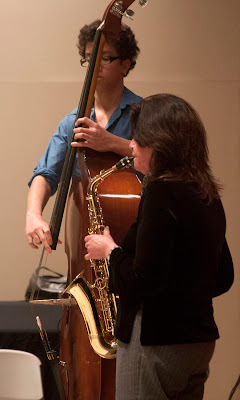 Daryl and Debbie Johns of Englewood playing. Photos by TOM HART/ FREELANCE PHOTOGRAPHER. 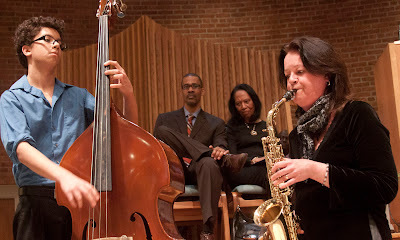 Daryl and Debbie Johns of Englewood playing sax and bass. Photos by TOM HART. 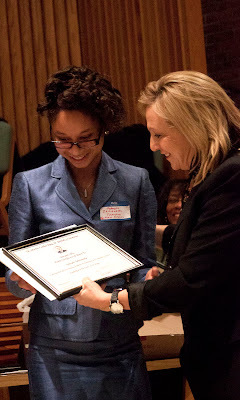 Oghogho Igbinbeweka of Teaneck Highschool her MLK certificate of merit from assemlywoman Huttle. Photos by TOM HART/ FREELANCE PHOTOGRAPHER. 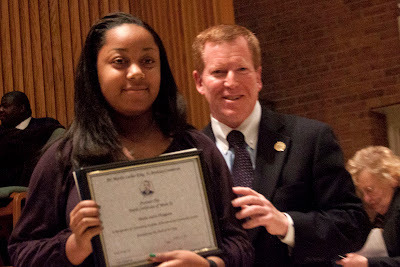 Misha Inniss-Thompson of Dwight Engelwood getting her award from Senator Robert M. Gordon. Photos by TOM HART/ FREELANCE PHOTOGRAPHER. Patrick Edmonds and Ashley Edwards recieving special recognition awards. 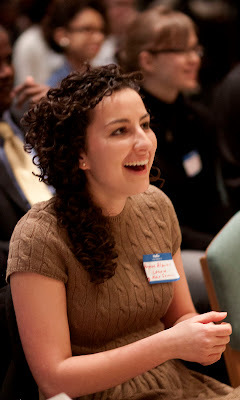 Ashley was in intern with Senator Weinberg.Photos by TOM HART/ FREELANCE PHOTOGRAPHER. 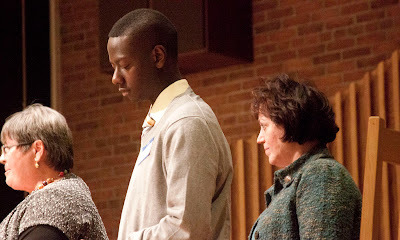 Paul D. Kioko holds his head humbly as Barbara Giarmo of the mlk program committee sings his praises and reads from his essay. 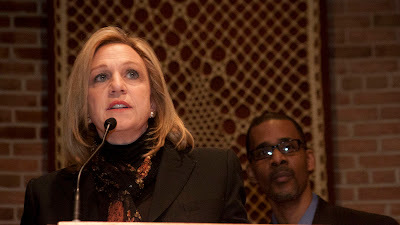 Kathleen Donavon, county exec, at right waiting to present the award.Photos by TOM HART. 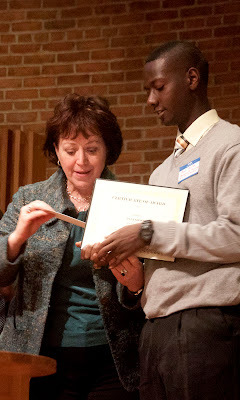 Paul D. Kioko recieving award and scholorship from Kathlleen Donavon, county exec. She appears pleased at showing him the chieck. Photos by TOM HART. Singing of 'We Shall Overcome'...everyone holding hands and enough beautiful voices for this familiar tune. Photos by TOM HART. 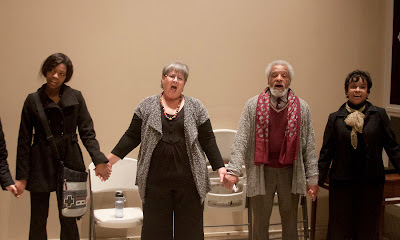 Singing of 'We Shall Overcome'...everyone holding hands and enough beautiful voices for this familiar tune. 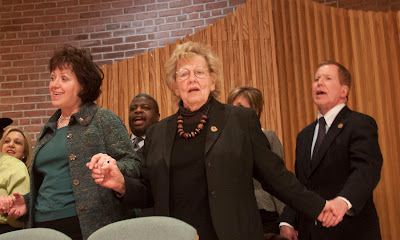 Kathleen Donovan, Loretta Weinberg, Robert Gordon... Photos by TOM HART. Singing of 'We Shall Overcome'...everyone holding hands and enough beautiful voices for this familiar tune. 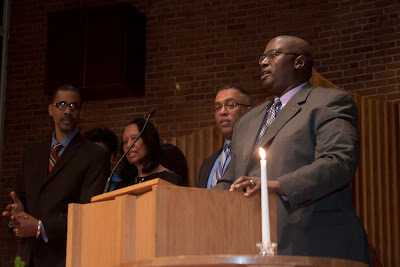 At front is Rev Dr. Edna Thomas, former state senator Arnold Brown, Teaneck board of Ed President Dr. Ardie Walser and Tyree Grant Photos by TOM HART. Singing of 'We Shall Overcome'...everyone holding hands and enough beautiful voices for this familiar tune. Aryana Alborzi of Leonia Highschool. Photos by TOM HART. 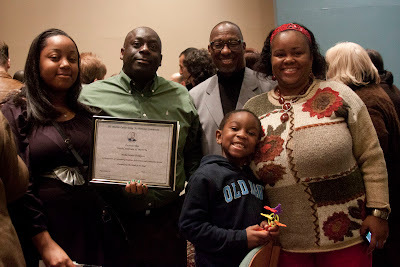 Misha Innis-Thomson of Dwight Englewood with her award and family and the very social Tyree Grant (in sweatshirt). Photos by TOM HART. 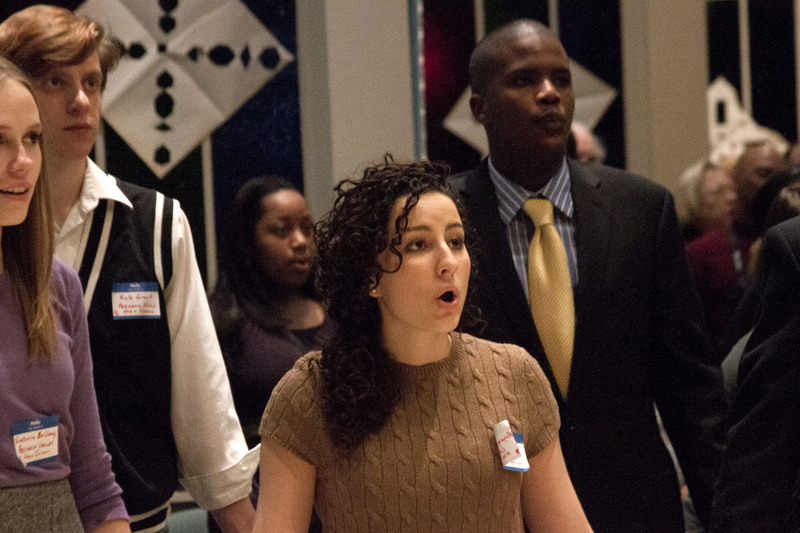 Dexry Pazant, a graduate of Englewood's highschools, singing. Photos by TOM HART. 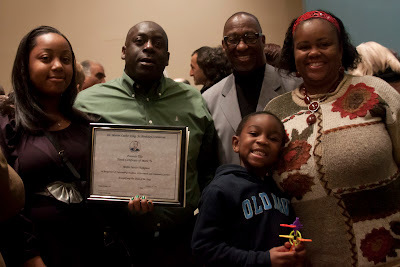 Misha Innis-Thomson of Dwight Englewood with her award with her family including Tyree Grant (in sweatshirt). Photos by TOM HART/ FREELANCE PHOTOGRAPHER.